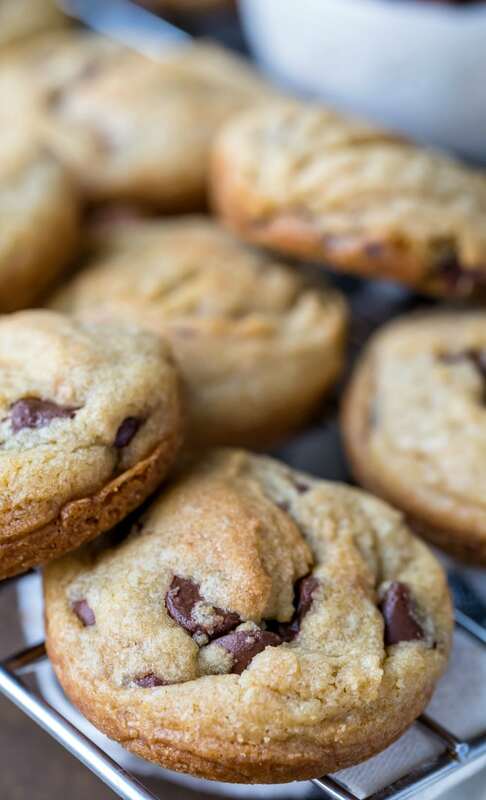 Muffin Tin Chocolate Chip Cookies are easy chocolate chip cookies that are soft and delicious. What makes a good chocolate chip cookie? If you ask 10 people, you’ll probably get 10 different answers. 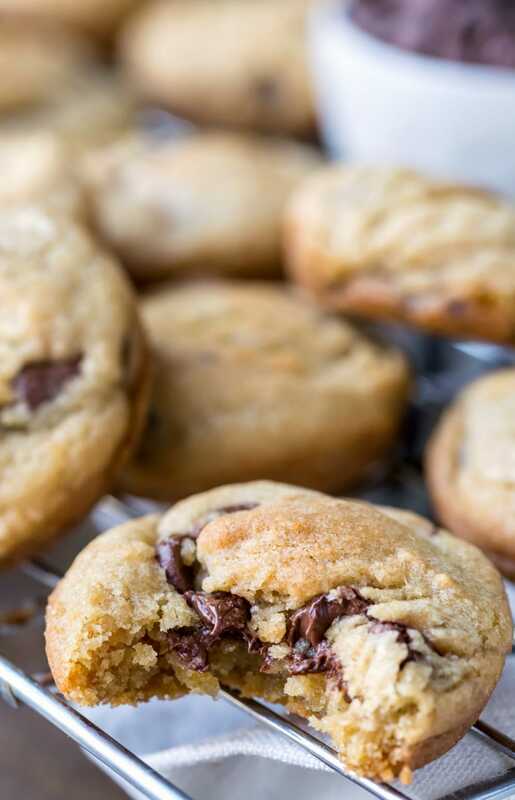 These Muffin Tin Chocolate Chip Cookies are for people who like soft chocolate chip cookies with chewy edges that are easy to make. How do you make easy chocolate chip cookie dough? This cookie recipe is simple to make. There’s no need to use a mixer – hand or stand. In fact, I suggest mixing them up by hand. Also, since the butter is melted, the butter doesn’t have to soften beforehand. And there’s no need to chill the dough before baking. All of which makes this a simple, easy chocolate chip cookie recipe. How do you bake cookies in a muffin tin? It’s easy! I use a baking spray with flour to grease the cups of the muffin tin. Then, you just place a scoop of cookie dough into easy cup and bake. How do I get the cookies out of the muffin tin? Wait about 5-10 minutes for the cookies to cool a bit. Then, use a thin rubber spatula to gently pop the cookie out of the tin. As long as the pan was greased well, it should just slide right out. Or you can use muffin tin liners to line the pan. Parchment Baking Liners: This is my favorite brand of baking liner. They are nonstick, and everything just peels right off. I like that I never end up with half a muffin or cupcake stuck to the paper when I use them. Baking spray with flour: I use baking spray with flour most of the time when I’m baking. I like that it greases and flours all in one spray, and I’ve never had trouble with anything sticking when I use it. 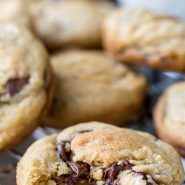 More easy chocolate chip cookies from scratch! 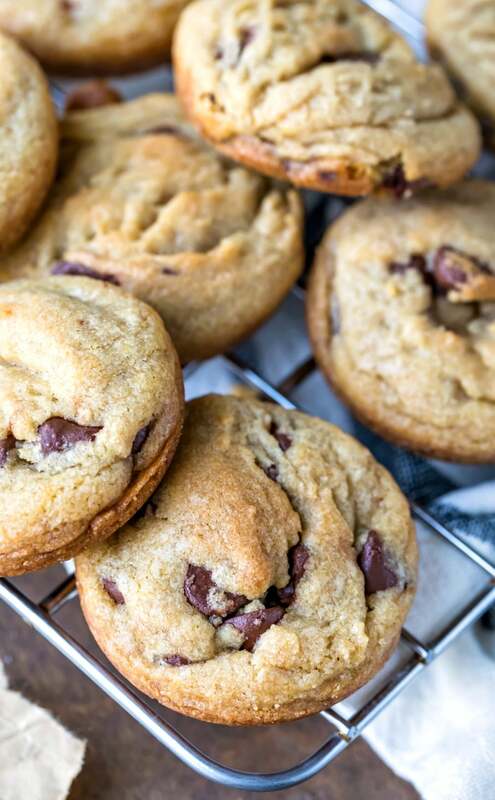 If you’ve tried this muffin tin chocolate chip cookie recipe, don’t forget to rate the recipe and leave me a comment below. I love to hear from people who’ve made my recipes! You can SUBSCRIBE to receive my latest recipe newsletters or FOLLOW ME on FACEBOOK, INSTAGRAM and PINTEREST for even more delicious food. 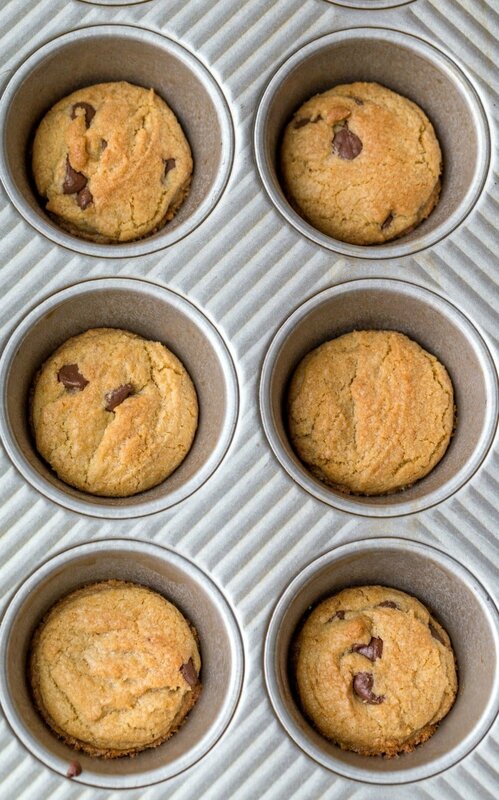 Preheat oven to 350 F. Grease standard 12-cup muffin tin or line with paper liners*. 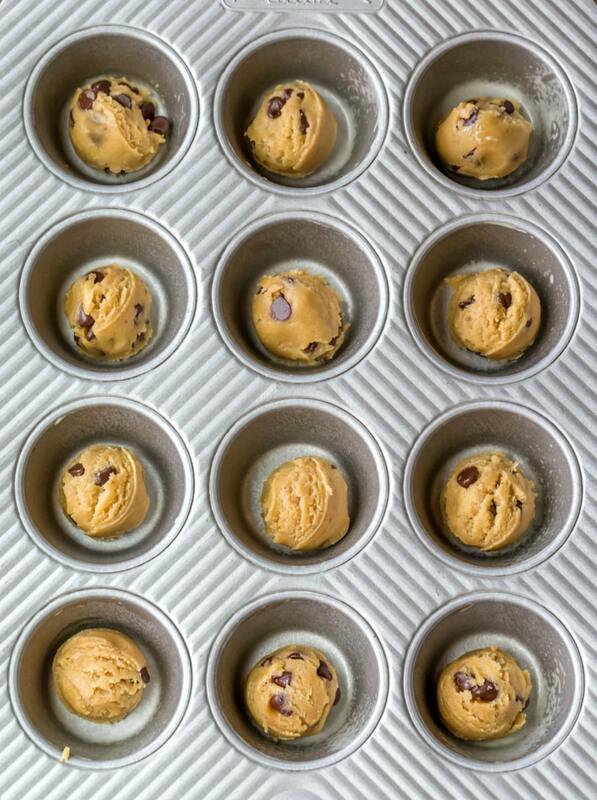 Using a medium cookie scoop (1.5 tablespoon), drop a scoop of cookie dough into each muffin cup. Bake for about 7-10 minutes, or until the edges of the cookies are just beginning to reach golden brown. Let cool in muffin tin for 5 minutes. Remove to wire rack to finish cooling. *I like to use parchment liners. They have a nonstick coating that makes for easy peeling. **I suggest stirring this recipe together by hand rather than using a hand or stand mixer. What a Great idea! The ‘bake in the muffin tin, keep from spreading’. I’ll be sure and try! Thx! !